Concrete pools may be common but once it designed creatively, it becomes a unique masterpiece! No one would say no about having their own swimming pool in the house. It would be very pleasing to be able to swim and dip in the waters even when you are just in your own home. What adds to the relaxation is when your pool area has a beautiful design. It might even look more beautiful than commercial pools! 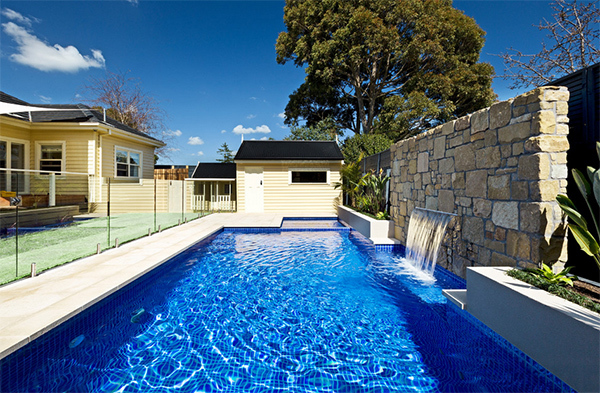 Pools are made from different materials but the most common pool material is concrete. It would be fair to say that a concrete pool is extremely popular. It is best for swimming pool construction especially because of its ability to get customized in form, shape and style. It can also be constructed at any place in your premises. I do believe that a great number of swimming pools area actually made from concrete. 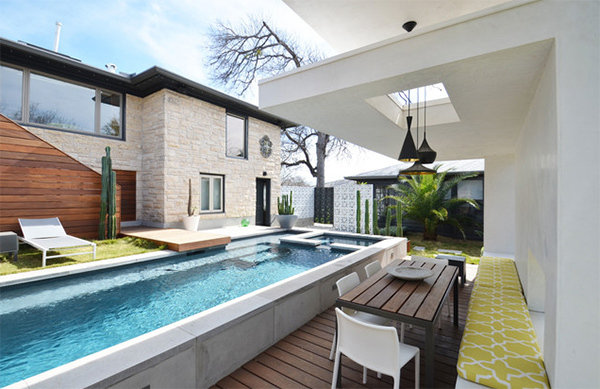 Now, we have collected some concrete pool designs so you can get ideas if ever you are planning to get a pool for your home. 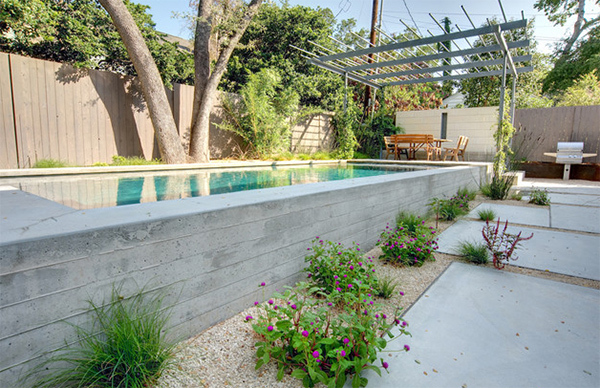 Concrete pools are popular for modern homes just like what we can see above. Isn’t it beautiful with its edgy look? In truth, the color of the pool is just so beautiful that I would stare at it for long before jumping into it! I’d say you can dive in this pool because it sure looks deep! And you can get a lovely view from its surroundings while you are in it. Looks fun? Beautiful pool that is a combination of an in and ground swimming pool. The landscaping is gorgeous too. Agree? 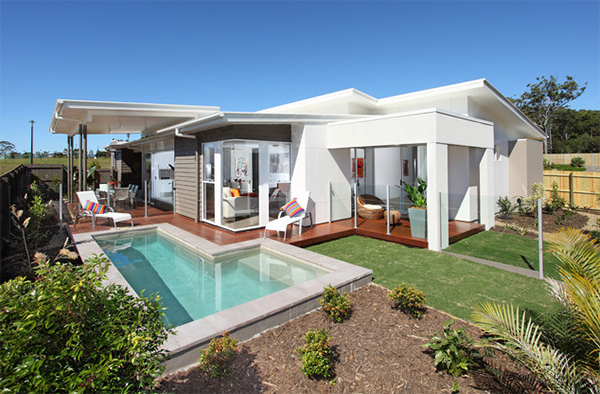 What a beautiful modern home! 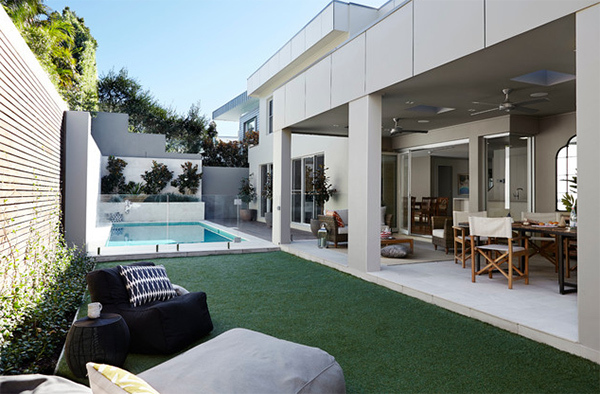 It has a white fully tiled pool and spa that is constructed within courtyard space using Bluestone coping and paving. 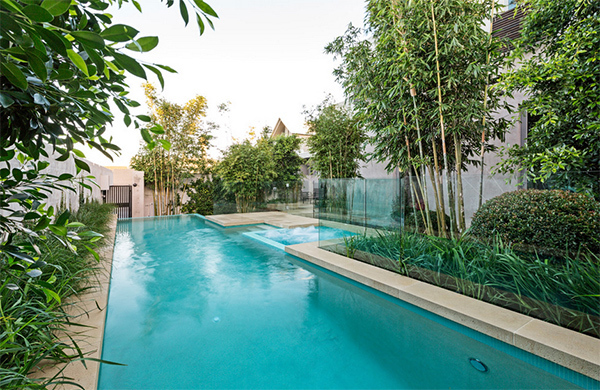 A low maintenance plunge pool that graces the exterior of this Brisbane contemporary home. 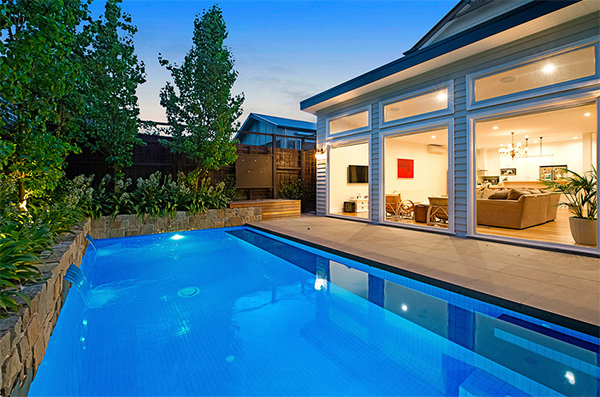 This looks like an ordinary home but with the pool there, it became a special residence! 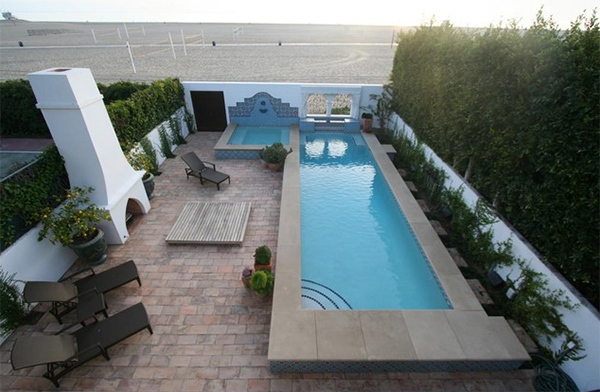 Stunning pool and landscape design that has the beauty of Moroccan influence as well modern design too. I love the unique appeal of the area and how they maximized the outdoor space. Who wouldn’t be happy to have an in ground pool like this? Lovely pool area indeed! I like the combination of materials here from wood to concrete. Even the landscaping is well done too. 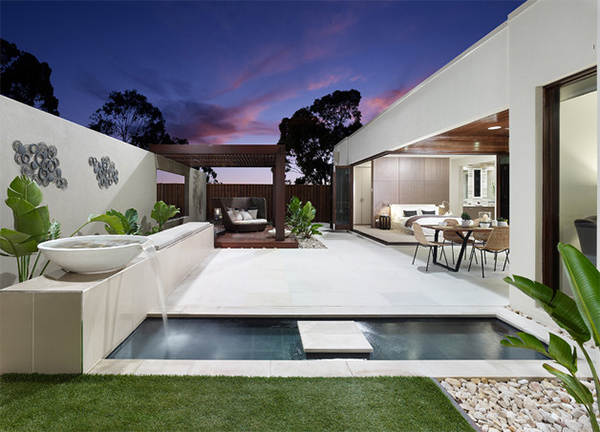 With a water feature integrated to the design, a pool would surely stand out! 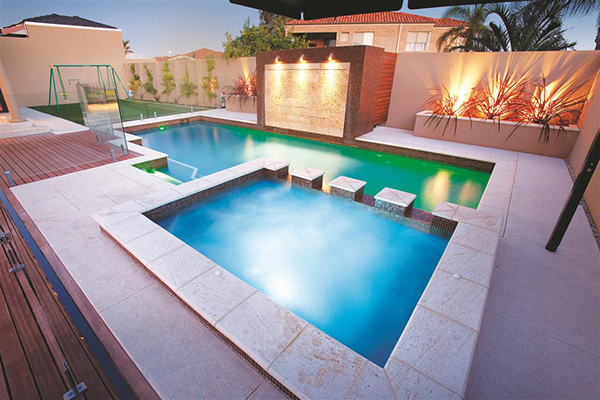 Oh what a gorgeous pool area! 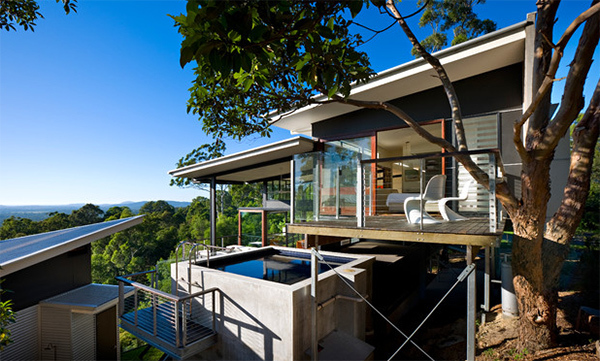 And yes, the house is a total stunner too. Note the colors used here as well as the decors on the wall and the manner of how the plants were arranged. 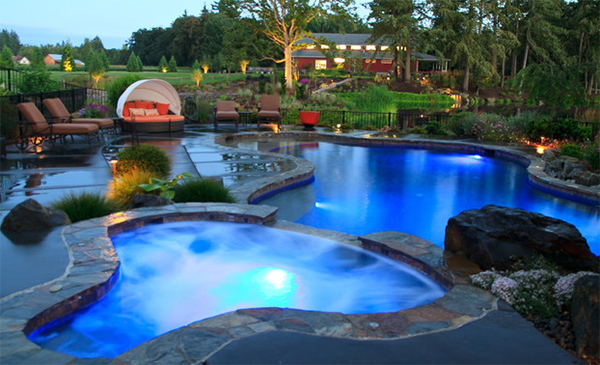 Get a dark pool area look that sure is very daring, bold and dramatic! Let the lighting do the job to bring in the much needed drama in the space. You can also get a simple long rectangular pool like this one. Add a waterfall and some plants around it to make it look even more inviting. I’d say adding a dining and seating area just near the pool area is indeed a great idea. Look at this example. It used wooden deck for the dining part and it also used pops of colors everywhere. A perfectly tranquil back yard pool with rich pool lighting and stone coping. But it isn’t just that. It has a free form style and natural stone used for its pavers. This could be a perfect location for parties! A lap pool with offset spa and infinity edge that also used glass mosaic tiles for the floor. It is surrounded by glass fencing for protection and safety. Love the way the plants were arranged too! And hey, that hot tub is very inviting! I like the idea that when you go up, you can dive down the concrete pool. But that’s not all. The landscaping is very well done like how the tree is surrounded by flowering plants. Aside from the pool itself, what adds beauty to this area are the black and white striped lounge chairs. The different levels of the area also add depth and appeal to the space. And take note of the natural landscaping all around it! 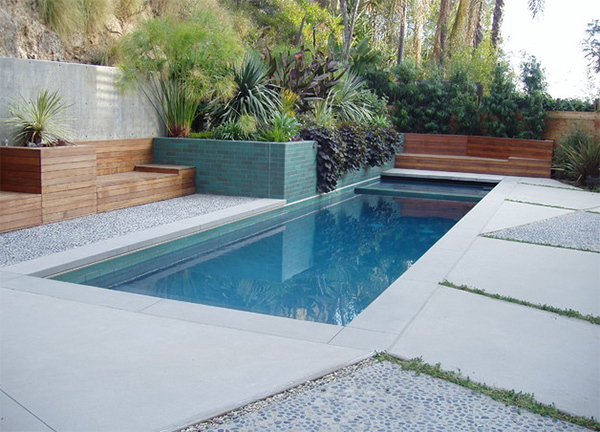 A Mediterranean pool area with a pavers and a rectangular concrete pool. This place is just so serene and it looks like you will get some peace of mind while you are relaxing here. You don’t have to go far in order to unwind! Beautiful! 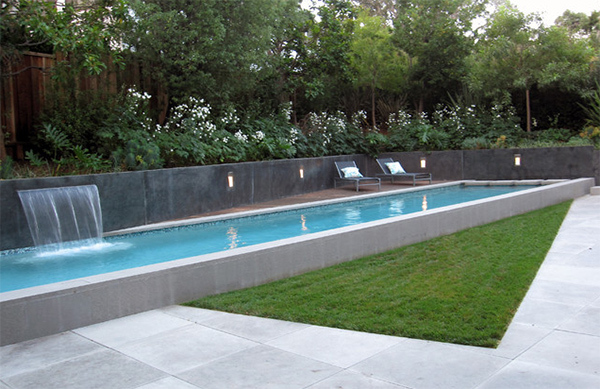 I absolutely love the contemporary design of this pool with an edgy look. Adding those trees give the space a subtle tropical feel. And yes, this home is very lovely indeed! You’d surely want to jump in the waters because of the effect the blue mosaic floor tiles can give. There is also a waterfall that comes out from that stoned wall that bring in more drama to the pool area. 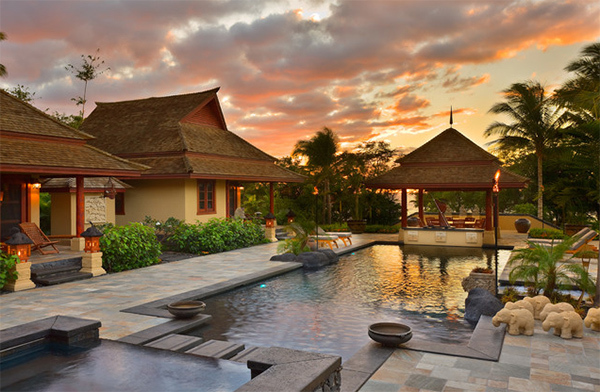 Asian inspired pool deck combining a spa and a pool. Take note of those little elephant decors. Aren’t they lovely? No boring swimming time for the family indeed if your pool area is this dramatic and private! What can you say? 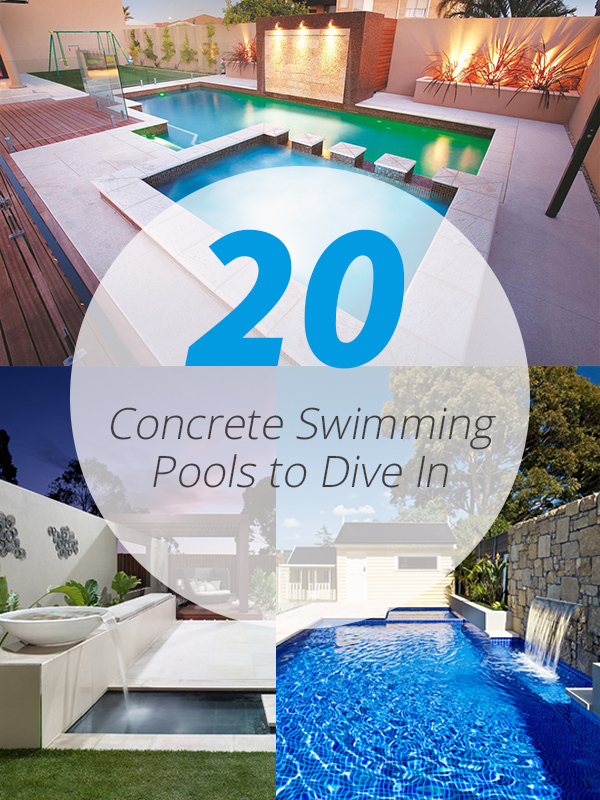 Well, a concrete pool is indeed widely used. There would also be an addition of ceramic tile finish on it too while other pool areas stick to the concrete. But then again, it would be neater to have tiling on it. Love the pools above? 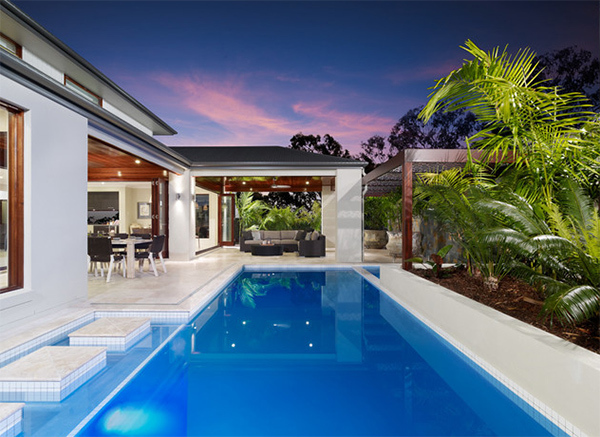 Well, we all love pools anyway but the design would vary from one home to another. Which pool design would you love to have for your home? Not to mention that if you build it long and deep enough, you can eventually start your own swimming academy in the future! I loved #12. The lighting and the dark blue made it look cozy… perfect.